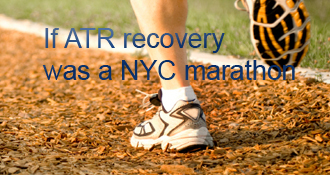 John has completed the grueling 26.2 ATR miles to full recovery! It’s been 3 weeks since the big “pop”. It all happened on April 13, 2014. I was playing a badminton competition on that night and it was already the 3rd game of my 3rd match. I was just about to move back to the center of the court after returning a drop when I heard a loud pop. My right leg felt like planted into the ground with a sharp pain like cramps. After a rest and the pain was gone. I thought it’s just cramps so didn’t take it too serious. (Of course I quit the game after that.) I even walked back to the bus stop and took a shower by myself. Now that I look back on that night, I suspect the culprit of my ATR might be the new socks, despite of the rainy and cool weather. I was wearing a pair of new socks that night which is a bit tighter on my ankle than usual. As what we learnt from the physics, even exerting a small force in the middle of a tight rope, the total force on the rope can become huge and thus can easily break it. I am not sure if that is the reason with my case. I shall definitely be more careful with what I wear for sports from now on. Anyway, on the next day, even the pain was gone, I was still worried about the loud pop and suspect it might be the ATR. So I went to see a GP and she referred me to take an X-ray and ultrasound and confirmed my fear. I went to the hospital in the afternoon and got my foot into cast with a pair of crutches. On Wednesday (April 16), I went to the Orthopedic department of the hospital and discussed with the doctor about my treatment. At that time, I was convinced that you need surgery to heal the ATR. So I was quite inclined to take the cut. However, after chatting with the doctor and did some online research on that night, thanks to achillesblog, I acknowledged the non-op method can just achieve similar results as the operation. Since I just moved to a new city by myself early this year, going non-surgical seems more suitable for me. I was put into the boot “Maxtra” right on my appointment while asked to wait for the decision on my operation schedule. So I declined the surgery the next day and hence started my NWB for the first two weeks. On my second appointment (April 30), 2 weeks after the first one, I was told that I can start TWB (Touch Weight Bearing) with crutch and my boot was adjust to PF(Plantar Flexion) 30’ to 45’. Norm mentioned that it may be a little more and earlier than other non-op protocols, so I guess I should also post the protocol I got for you guys to compare and comment. I guess the thing about this early hinging may not be too big a problem, as most of the time I just rest my leg on my foot as TWB. Besides with such fixed angles, you really cannot put much of your body weight on the foot anyway. But I do have a question regarding the PWB in other protocols. Should I do PWB as often as I should? Are there other exercises I should begin in week 3-4 for the next stage? I don’t really know where to post but any help would be appreciated… i am having a tough time coping with recovery time. I fully ruptured my right Achilles playing soccer. its been three weeks since my surgery date which was 6-4-2014. I am in a hard cast and its green, its nice. I am scared that i won’t be back to as active and athletic as i was before, i love soccer, i don’t want to stop playing. I know it’ll take a while to get back to normal and where i was, I’m just really nervous… any support would really help. Thank you Norm, for sharing your knowledge and experience! It is most helpful to a newbie like me, especially the PWB tips. Really appreciate it. I will try to stick to the UWO protocol and hopefully can achieve the same good results as you did. Cheers! If your protocol does mean to say FWB in the 4-8 week period, then it’s virtually identical to UWO in the WB progression. For most patients, “WBAT” either means FWB, or it means FWB a day or 3 later. In the real world, almost every transition and milestone in ATR Rehab could have As Tolerated tagged onto it, because most of us won’t do anything we can’t tolerate. The UWO Protocol told me to take out all my heel wedges at once, when I hit 6 weeks, but it didn’t feel good to me, so I spread out the transition over a day or 3. “Remove heel wedges As Tolerated” it MIGHT have said, but it didn’t. The whole PWB transition is a classic case. Some patients make it slowly, while others find themselves going without crutches (FWB) before their protocol calls for it. As tolerated. One other tip I suggest a lot: When you’re changing your ankle angle toward neutral, do it at bedtime and sleep in the boot, to give your ankle ~8 hours of NWB to get used to the “stretch” before you load it up. Thank you Norm for your detailed comments! That is really good information to me. I totally agree with you on “going slower produces worse results” and “go with a proven winner”. I guess that’s the main reason I posted the protocol here so that I can get others’ opinions on it. My preference is the proven bit.ly/UWOProtocol too, so I will try to get as close as I can to it. As you may notice from my protocol, week 4-8 is TWB (left out “crutches”). So I assume it is actually FWB in ROM boot, PF15’ to free PF, which is kinda like with a boot 2 cm heel lifted in the bit.ly/UMO protocol. (maybe it’s just a typo in my protocol. I will find it out in my next appointment.) So may I ask, Norm, is it after 4 weeks when you stop using crutches? If so, is WBAT [Weight Bearing As Tolerated] actual FWB? I am trying to find out how deviated my protocol is from the bit.ly/UMO protocol. Thanks! But the UWO Study’s protocol — bit.ly/UWOProtocol and summarized in achillesblog.com/cecilia/protocols — is quite a bit more aggressive than yours. In fact, all 3 of the highly successful non-op protocols in Cecilia’s chart are quite a bit more aggressive than yours. As you may have read already, going slowly non-op is worse than just a nuisance and a waste of time, it is also associated with worse results, including higher rerupture rates. While you’re supposed to be Touch WB from 2 wks to 8, the others get to FWB around 4 weeks in. And while you keep the boot for 12 weeks, the others wean off it at 8. I would fight for (or just adopt) one of the proven-best protocols. johnxue’s AchillesBlog is proudly powered by WordPress and WPDesigner..